2013. Lumps and bumps. William went to Dorchester Hospital to have a number of benign and other lumps removed from his face and head; too many hours sitting without a hat watching cricket at Lords in his youth. He was so keen on cricket he was actually put up for membership by one of his office colleagues, and became a member of the MCC! We expected that he would be kept in hospital overnight, so I returned home to get his things and just as I was about to leave a taxi delivered William back home with long cuts across his head and sides of his face. The hospital having sewn him up, some of the worst stitching ever seen, sent him home in a taxi with dried blood still dribbled down the sides of his face and neck and with two spectacular black eyes. He got out of the taxi at home looking like Frankenstein’s monster, all he lacked was a bolt in his neck. The nursing at Dorchester leaves a lot to be desired as we were soon to discover. Tragedy (i). Tragedy struck, though we did not know how much it was going to affect our lives till later. William had what we now surmise was a mild stroke, he was walking alone in Bridport about to do some shopping, and the next minute he was lying on his back on the pavement. He hit the back of his head, blood everywhere, he then struggled to his feet, and fell forward and put out his right hand to stop his fall and smashed to pieces his shoulder bone and arm bones where they meet. A lady who was walking behind at the time, put his head on her lap and called 999. The ambulance came to me with William looking rather bemused with blood on his face and his arm tied to his side, and collected me and we were driven to Dorchester Hospital. The surgeons started to operate on him the following day but realised that the damage was worse than they feared and I think they had to make a complex metal structure to insert into his shoulder and so he was operated on again the following day. The shoulder slowly mended but there was something clearly wrong with William. He appeared to be in a state of bewilderment, and his short term memory seemed to have been affected. We put it down to something we had read on-screen about anaesthetics affecting the memory of elderly people when they came out of an operation. So we thought everything would right itself. It didn’t. Venice. 6th-12th May 2013. Monday. So unaware of what was wrong, and me undeterred, we left for the airport to Venice. At the airport William set off all the security alarms, though everything had been explained to the security staff beforehand, but everyone got highly suspicious when he said he could not raise his arm where the bleep was at its noisiest. No amount of explaining would make them believe he could not raise his arm and did not have a bomb under it It must have been the most excitement they had had all day. Finally they let him go and by this time William was all for turning back and going home. However, it was now too late. We had booked ourselves into Business class, and were so were pampered by the lounge that William calmed down. Venice was a beautiful as ever and I hope William got something out of the visit as it was to be our last sight of Venice. We slept and ate on a river cruise boat the MS Michelangelo, which was moored on the Grand Canal and we had magnificent views from our cabin of San Giorgio Maggiore. On our way to the boat we had lunch at the Villa Castello Giustianian in Roncade. Built about the end of the 15th century. The owners were wine producers and tried during lunch to sell their product, but I have my doubts whether anyone bought any cases of wine. We were to be shown around the Villa but were only shown the hall. Very disappointing. We then proceeded to Venice where we boarded and squeezed ourselves into our tiny, tiny, cabin. It was outrageously small. The main reason I had chosen to go on the trip was that all our food was provided for us, something notoriously difficult in Venice. It’s either rubbish or tears a hole in your pocket, and there were one or two places which we had always missed out on in the past. I thought we would remain as independent as possible and use whatever organised trips we felt could be rewarding. Tuesday. First on the agenda, for the group, was a visit to St Mark’s Square to see the Basilica. Bad move. Three million other people were also wanting to visit and the only way the authorities could cope was to have a shuffling stream of people go around the perimeter of the interior all taking photographs. It was pure hell. When we thought of the old days when we used to just walk in and where everything was open and you could wander at will. Not any more. Not a good start. The afternoon we went on a set visit to the Accademia. It was many years since we had been and had avoided it when they started to put up the scaffolding. That was many years ago, the scaffolding was still there, and the interior was dirty, dusty and gloomy, and our so called local guide was clearly bored out of his tiny mind. A disastrous day altogether. At least the food was good on the boat, but the guests were a rum lot. I don’t think any of them had visited Venice before, well not the ones we talked to anyway, and not one of them had a clue or any interest whatsoever in architecture, paintings or history, in fact, why most of them were not in Benidorm, is a mystery. That evening we went to the Chiesa Della Pieta (the so-called Vivaldi Church) to hear a private concert of Vivaldi’s Four Seasons played by members from various Venetian orchestras. Excellent performance. I think the group would have preferred a knees-up or whatever people who are as thick as planks do these days. I fear I am becoming rather intolerant. Wednesday. The next day fortunately was a trip to Murano, Burano and Torcello. Beautiful day, we sat on the top uncovered deck, and it was lovely to do that trip again. If only the local guides had not thought that we had to be lectured non-stop about everything that we passed or passed us. On and on it went. Most disturbing. Maybe the Benidorm crowd liked this sort of thing, it’s a wonder we did not have a sing-song. We were left to our own devises in Burano which was a delight and we visited the church to see the paintings. A Crucifixion by Tiepolo and some charming paintings by Mansueti (16th century) including his Marriage of the Virgin. They had been removed for restoration the last time we had visited. On to Murano where we were fed into the hellhole that was one of the glass manufactories, took our seats, realised what we were in for and made our escape to the door just in time while the rest of the party trooped in and sweltered and watched glass being blown. We made our way to San Pietro Martire to revisit the great Giovanni Bellini of the Doge Augustino Barbarigo being presented to the Madonna and angels and also his Assumption with Saints. There is also a St Jerome by Veronese, a Tintoretto and a host of other great works. We got so enthralled that we did not notice that the doors had been closed and we found ourselves shut inside the church. Fortunately a priest came to our rescue and let us out via the beautiful cloisters which are not normally open to the public. We then went to Torcello where we walked along the pretty footpaths at the side of the canal till we got to the Cathedral. The cathedral in Torcello is nothing short of magnificent. The apse with its mosaic of the Virgin and Child with a row of saints must be one of the most striking masterpieces of Byzantine art ever created. Such simplicity but what an impact. We had visited Torcello before but the mosaics are so wonderful that they appeared just as awesome as ever. And of course there is the incredible Doom beneath a crucifixion. Some of the party actually seemed interetested in it and as there was no guide allowed I found myself ‘reading’ the parts of the Doom to a few of them. Very strange experience. We then all walked back and stopped off at a wonderful fish restaurant where we were fed the most marvellous fish soup, grilled fish and a terrific dessert. The waiters kept on coming around with seconds and thirds. Quite one of the best meals we have had. Thursday. Went on a day trip with the party to Verona. Revisited the Roman arena where we had quite an informative guide. The last time we had visited Verona the arena had been closed for the opera. We were then herded into a ‘tourist’ restaurant, with hundreds of other groups and served one of the worst meals ever placed before us. A hungry dog would have turned up his nose at it. We decided we could not eat such rubbish and left. I went to find our posse of guides and managers, who, unlike us in a vast dark room at the back with the rabble being served rubbish, were all sitting at tables in the main public restaurant at the front of the building and were being served what appeared to be decent food. It was all very embarrassing for them, I was pleased to see, as we had been herded in by a separate entrance and were really not meant to see this exhibition of gross behaviour on behalf of the staff. I told them we had fled from the foul mush that was being served in the back room and said I hope they were enjoying their food. I then enquired where and when the party was to meet for the return journey, and having settled that, we made our way to the Castelvecchio, which we had visited before but contained a collection of paintings and sculptures well worth seeing again. Oh to be rid of the crowd, and walk through those beautiful rooms with its marvels. All cool and quiet. 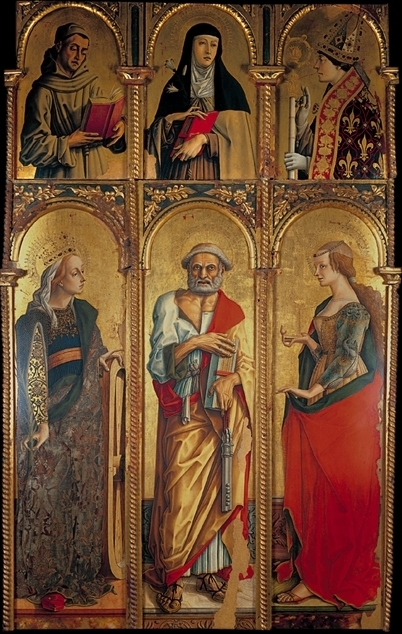 Carlo Crivelli, Mantegna, Giovanni Bellini, all the greats. From there we found a café and filled ourselves with delicious cakes and coffees. Met up with the gang and returned to the boat. That evening we were ‘entertained’ by a singing trio of Gondoliers. Three of the ugliest, fattest and thinnest gondoliers that could be found in Venice; all were ugly, two were fat and one was thin. They gave us a sing-along, and the whole ‘Benidorm’ group got all happy clappy roaring out tired old songs. We fled. We seemed to do a lot of fleeing during this trip. Friday. We should have known better, but we sadly joined the group walk supposedly through the back streets of Venice, thinking we would be introduced to something new and undiscovered. It was hell and a complete waste of time. ‘On your left is this building, its dates from… dah, dah, dah’. We swept by churches we knew contained treasures, walked past places where we had stopped to have coffee and cakes in the past. It was a nightmare. Finally finished up at the hell which is the Rialto Bridge today. Thousands and thousands of people, shoulder to shoulder and it started to rain. We caught the vaparetto back to the boat. After an excellent lunch the group was going to spend the afternoon sailing around the islands. We thought stick it, there would be the same tired voices ringing in our ears and I thought I bet they don’t even stop at one of the islands. We later learnt that indeed they had not stopped once the whole afternoon. Thank goodness we did our own thing. We thought we would do a Tiepolo hunt and also see whatever else we could rediscover for the afternoon. So armed with maps and guidebooks, we spent a wonderful afternoon wandering around obscure back streets hunting them down. We finished up at the Scuola Grande dei Carmini. Pure heaven. Got back to the boat to find a very disgruntled, dare I say ‘bored’ group all of whom thought the boat should have stopped at least once. What an escape. Dinner was excellent as usual. One thing that they did well on board was to serve the most delicious meals. Saturday. Today was a real highlight, one of the main reasons we joined this particular trip. We were to visit Vicenza and the Villa Barbaro in Maser. It poured with rain, I mean it came down in buckets. We had visited Vicenza in the past but had only seen the Olympic Theatre. It is 16th century, the oldest surviving enclosed theatre in the world and Palladio’s last work The first play performed here was Oedipus Tyrannus by Sophocles. Magnificent permanent set representing a piazza and streets in perfect perspective. We were led to our seats together with a thousand and one other ‘groups’ and we then had what was called a ‘light show’, ie, lights playing over different part of the set. However this was accompanied by the most hideous deafening pop music. Clearly playing to our Benidorm mob who must have been delighted. A few minutes of that appalling noise saw us fleeing the place. Quite, quite hideous. How far can one get from Oedipus Tyrannus ? Why could the authorities not employ some actors to enact a short scene on stage? We were now free of the mob. I had set my heart on seeing the Giovanni Bellini in Santa Corona, so we made our way there and visited the Bellini, a late work set in a superb altar. We next wended our way to the Palazzo Chiericati – Palladio again – which houses the Museo Civico. Sadly the museum was closed for restoration. The number of times that has happened to us in Italy. My heart sank. Fortunately for us there was quite a large exhibition in the crypt of the Palazzo whose theme seems to have been local families and their children many of the pieces from their own collection and many loans. It was absolutely delightful, but oh how I regretted that we had missed seeing the collection; we will never return. Met up with the mob and were coached to the Villa Barbaro in Maser. We had seen many of the Villas of the Veneto but had always missed this one. We were served a fine lunch on the estate. We found ourselves at a large table which we then discovered was occupied by a group of National Trust staff. Thinking we could have an engaging conversation as we had the NT in common, we introduced ourselves and typically on discovering we were volunteers, a glass wall crashed down between us and we were completely ignored for the remainder of the meal. What is it about NT staff. Are they picked for their bad manners? From their conversation among themselves we decided we were not missing much as it was mainly bitchy gossip about other members of staff. After this rather frosty lunch which sadly angered me a great deal, I had served 20+ years with the NT as a volunteer and this is the sort of behaviour handed out to us by its boorish staff. Seething we visited the Villa where I calmed down. Built by Palladio in 1560 and covered with delightful Veronese frescoes. Wow. We returned to the boat for dinner and then set off in motor launches to the Palazzo Zen, where the Zeno family still reside. Built in 1537 with large palatial rooms of no particular distinction. However it is always interesting to find oneself in a Venetian palazzo. Anyway the reason for the visit was to hear some operatic singing and some violin and piano solos. We were then entertained by some very good singers who gave us arias from Donizzetti, Rossini, Puccini, Verdi, Bizet, the pianist played Clair de lune by Debussy and there was a violin piece by Vivaldi. A truly memorable evening, they even sang O sole mio for the Benidorm contingent. We then returned by motor launches back to the boat down the Grand Canal with the twinkling lights of all the palazzi. I was prepared to point out some of them to our fellow passengers, but was astounded by remarks from most people in our launch that they considered it a shame they had had to endure such caterwauling on their last night in Venice. What would they have preferred Roll out the Barrel? Sunday. Made our way to Treviso for lunch, managed to see the Titian Annunciation at the Cathedral, the Art Gallery being closed on Sunday. Not one of his great works. Flew home. What a strange holiday with great highs and some terrible lows. Always go with an art orientated group. But as it turns out it would not affect us because, though we did not know it at the time our next trip would be our very last. June 2013 Le Marche, Italy. Monday: We took a trip to Le Marche with Martin Randall from 10-18 June. We had booked it months ago, but William did not want to come, so unlike him, but I determined that we would go and so I am afraid I virtually dragged him onto the trip despite his protests. I always describe to people that Le Marche occupies the calf if you imagine Italy as a leg. We little thought that it would be our very last trip abroad. We were a small group, just 14, with a young lecturer and a most efficient and warm tour manager. We travelled to Heathrow by taxi and stayed in a hotel overnight. We had to check in at the ungodly hour of 7.15 at the latest. We were able to stay in the Business Class lounge while waiting for our plane, as we had treated ourselves to Business Class tickets. We helped ourselves to lavish snacks and coffee, and William said he was going to go to the toilet which was on the other side of the lounge. So off he went. A short time later he appeared but minus his jacket. His jacket which contained his passport, boarding pass, half our money, we had been told there would be very little opportunity to change travellers cheques, and goodness knows what beside. He looked thoroughly bewildered and I suppose I should have started to think something was not quite right. I gave an agonised shout across the room asking him to go and get his coat. He just did not understand why I was making such a fuss and came and sat down quite oblivious of my panic. Our whole trip would have come to a very nasty halt if someone had made off with his coat. Fortunately for us a young man appeared from the toilets holding up William’s coat and asking if anyone knew who it belonged to. What a relief. There are still honest people around, thank goodness we were in such a small lounge . We travelled in some style to Bologna my heart still racing to think what a disaster had been avoided . We lunched at Bologna and got to know some members of the group. They really are a nice bunch clearly all art lovers or they would not be on this trip. Martin Randall does seem to attract like souls. From there we coached to Urbino and booked into the Albergo San Domenico very comfortable and cool. The whole essence of the trip was to look at paintings, in particularly those of Lorenzo Lotto, one of our passions. The sad fact which one of the party had discovered is that there was, at the time of our trip, a major exhibition in Italy on Lorenzo Lotto. Immediately outside our hotel was a delightfully tiny Egyptian Obelisk 590 BC which had been donated to the city by Cardinal Annibale Albani. Tuesday: Our first stop of the day was to visit the Montfeltro Palazzo Ducale built from 1465-1474 by Luciano Laurana and regarded as one of Italy’s finest palaces. We had visited it many years ago, but my goodness it had changed. When last seen it was dusty and very neglected, now it positively sparkled. Everything in that vast cavernous palace was in impeccable order and the paintings and rooms shown to great effect. Of course one of the great highlights is the Piero della Francesco Flagellation and that strangely rather wooden work of his the Madonna della Sengallia. My favourite picture is of Federico de Montefeltro and his son Guidubaldo by Petro Berruguete, one of those really charming and unforgettable paintings that I carry around it my head. Of course the palazzo is crammed with masterpieces and the guidebooks pepper their pages with * indicating the most important works. Something we did no see on our previous visit was the delightful panelled Duke Federico’s Study. Its lower walls covered with intarsia trompe l’oeil work, a form of inlaid wood similar to marquetry. Musical instruments left on ledges, a squirrel, distant views through pillars, etc. The top level is covered with portraits of contemporary and historical characters, Homer, Cicero, Moses, Dante, St Augustine etc., some of them now adorn other art galleries but are shown here with copies. Our first Lorenzo Lotto of the trip this one of St Roch which had somehow escaped the exhibition as fortunately had many others. Next to the Cathedral to see some fine Barocci works. Finally to the Oratorio of San Giovanni to see the quite beautiful frescoes of the lives of St John the Baptist and the Virgin by Lorenzo and Jacopo Salambeni of 1416. What a wonderful morning. After lunch we were taken by coach to our next port of call Recanati. Recanati is a a charming and little known hill town. It housed our hotel which was facing a small hot road with much traffic. At the back it could be seen that the hotel was perched on the edge of a cliff with the most magnificent views across the valley to the snow covered Appenine mountains We found ourselves assigned to a small hot room facing the road. There was no way I was going to spend any time in that room, so I went to reception and asked for a better room. They said it would cost. I said I would pay. It says a great deal for Martin Randall that when I told them about our experiences with rooms on our return they reimbursed the money. Gone were the days when we put up with whatever we were given. We then resided in this magnificent large cool spacious room with a view to die for of the distant snow covered Apennine mountains with smoke drifting up from villas in the valley which was covered in cultivated fields. Wednesday. The next morning we went in search of Lorenzo Lotto. The church of San Domenico had only a copy of a rather poor work by him, the original had gone to the exhibition. However our next port of call the Civic Museum of Recanati had somehow been overlooked by the exhibition organisers. More fool them, because it holds a haunting Annunciation and one of his great masterpieces the San Domenico Polyptych. Magnificent. Everyone’s jaw dropped, we knew we were standing before a masterpiece. After lunch we set off to see the great pilgrimage Basilica of Loreto. The massive basilica was built to cover the house of the Virgin which had apparently been transported by angels from Nazareth to Croatia in 1291. From there the angels flew it across the Adriatic to a laurel wood in Italy which gave its name to Loreto. All very batty and odd. This rather humble nondescript brick building is encased within a breathtakingly beautiful inner building sitting in the centre of the basilica. It was designed by Bramante and is covered in statues by a mass of great sculptors of the 15th century. Two of the basilica’s many treasures are the delightful frescoes by Melozzo da Forli (1477-79) containing a ceiling of dancing angels and the Conversion of St Paul by Luca Signorelli. In the museum we met up with more rather minor paintings by Lotto. We were to stay longer at Recanati but the hotel had informed Martin Randall that some Saudi prince had booked to take over the whole of the hotel in order to race his horse in some famous local horse racing event and the hotel owners had belatedly cancelled his booking. Thursday. Today we visited the beautiful little hill town of Cingoli. It is known as ‘The Balcony of the Marche’ because on a clear day you can see across the Adriatic and the Croatian mountain tops. We were met by the local guide who held the keys to all the main buildings in the town. Heaven help the poor tourist who arrived to get into the churches; we had the keys. Our quest was the Madonna of the Rosary by Lorenzo Lotto in the church of San Domenico. A monumental piece. Strange that such an out of the way place should have such a jewel. It isn’t even mentioned in most guidebooks. The town even boasted an art gallery which contained not much of interest but was a delight with its small collection so beautifully arranged and cared for. We then visited Tolentino. Hot, full of traffic, a manufacturing town but well worth a visit. The Basilica of San Nicola contains an extraordinary chapel covered with mid 14th century frescoes by the so called Master of Tolentino. The frescoes tell the story of St Nicola, and scenes from the life of Christ, very naïve crammed with figures and I loved the angels surrounding San Nicola on his deathbed all swaying about playing musical instruments. Why isn’t this more known about. There is also a very moving Crucifixion. On to the Duomo which has a chapel of the Sarcophagus which contains 4th/5th century frescoes and a sarcophagus to an early Christian family. 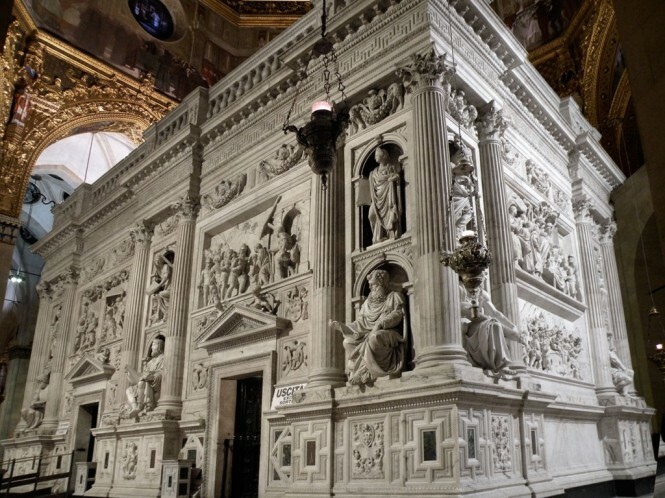 The sarcophagus contains the remains of Flavio Giulip Catervio his wife Settima Severina and their son Basso who died when he was 18 and is buried with his parents. Covered in carvings, depicting the couple themselves and scenes from the bible. On to our new destination for the next day or so, the beautiful Villa Quiete, in Montecassiano. The hotel was set in its own spacious grounds and we thought great, what wonderful views we will have. We were shown to a small quite dark foul room, smelt mouldy and was overshadowed by a large tree and overlooked the car park at the back. Totally unacceptable. Again I shot off to reception and asked for a better room, preferably with a view but not of the car park and gardeners work sheds. The proprietor was none too pleased as I kicked off about the awful room, but along came our tour leader who asked the manager why we had been assigned such a room when clearly there were many empty rooms overlooking the gardens. After some lengthy rather heated discussion in Italian, we were reluctantly shown to an absolutely magnificent room, light, airy and spacious overlooking the gardens with enormous windows on both sides, comfortable armchairs and a luxurious bathroom. Always kick up a fuss. I wish I’d learnt to do it earlier in our travels. Friday. Today we set off for Ancona for the day. I think it was in Ancona that I began to get very worried about William. Something was very wrong, but being ever the optimist I put my worries aside. Very bustling city. We went up the hill to visit the Cathedral, it was badly damaged during the war and had been built on the site of a Temple of Venus and it is thought some of the pillars come from the temple. On the trail of Lorenzo Lotto we then visited the Church of San Francisco alle Scale which has his Assumption of the Virgin. Next the church of San Domenico to view an Annunciation by Guercino and a Titian Crucifixion. Finally onto the Pinacoteca Civica to see Lotto’s Virgin and Child with Saints and The Madonna of the Halberd. We then did a walk through the town looking at the various grand facades of buildings, including the charming Church of Santa Maria della Piazza (11-12th century). Coach to Jesi, an industrial town but blessed with a collection of Lorenzo Lotto paintings – An Annunciation, The Story of St Lucy, a Deposition, A Visitation, etc. What a feast. Of course I began to realise that what we were missing were Lotto’s magnificent portraits which had presumably been bagged for the exhibition. Thank goodness these had not also been bagged. Then back to our lovely room in a state of some exhaustion. Saturday. We coached to Monte San Giusto. The town’s masterpiece is Lotto’s Crucifixion in Sant Maria in Telusiano. Wow! One of his great works. There isn’t a gallery in the world that would not love to get its hands on this painting. Had a delightful lecture from a local guide, who was so proud and thrilled to show off the town’s great painting to us. She then took us to the Palazzo Bonafede which serves as the town hall to show off one of San Giusto’s other treasure a room known as the Bishop’s Room entirely frescoed by Amico Aspertini (1457-1522); a scorpion had been painted on one of the frescoed wall hangings. Coach to Fermo to see the art gallery with its treasure The Legend of St Lucy by Jacobello dei Fiore (1410). St Lucy by Jacobello dei Fiore (1410). We then went to our final hotel of the trip,The Palazzo Guiderocchi (1500) in Ascoli Piceno. We were given a delightful cool and spacious room with a painted ceiling and beautiful bathroom. Late in the afternoon we went on a walk around Ascoli Piceno. visited some of the impressive squares in the town, the Piazza del Popolo is considered to be one of the most beautiful in Italy. Most of the buildings in the historic centre are built of a grey/white travertine marble. Dined independently that night with a few people in the group with whom we had made friends. Sunday. William announced that he would not be joining the group that day but would stay in the room as it was so comfortable. I’ve never known him to miss out on a single day of any trip we have ever made. Alarm bells were really beginning to ring. So I left him in his comfortable chair, arranged with management for him to have a snack lunch in the hotel as they only served breakfast and I set off with a heavy heart. Our first trip was to the delightful hill town of Montefiore dell’Aso. 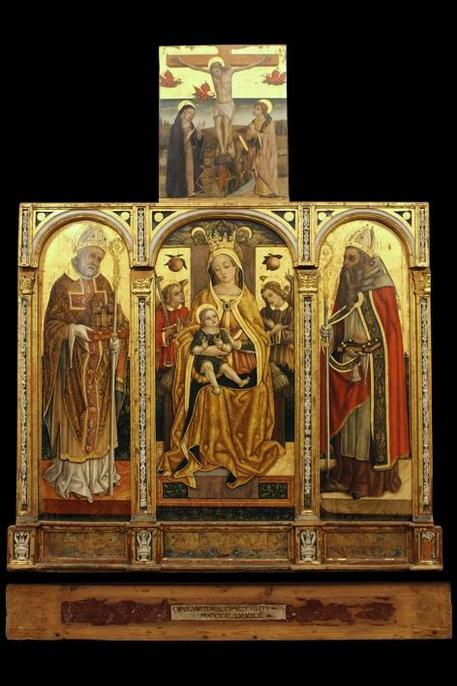 We were met with the town guide clutching all the keys to visit the local museum the Polo Musele de San Francisco to see what remains of the great Crivelli polyptych some of whose panels are the prize possessions of galleries around the world. 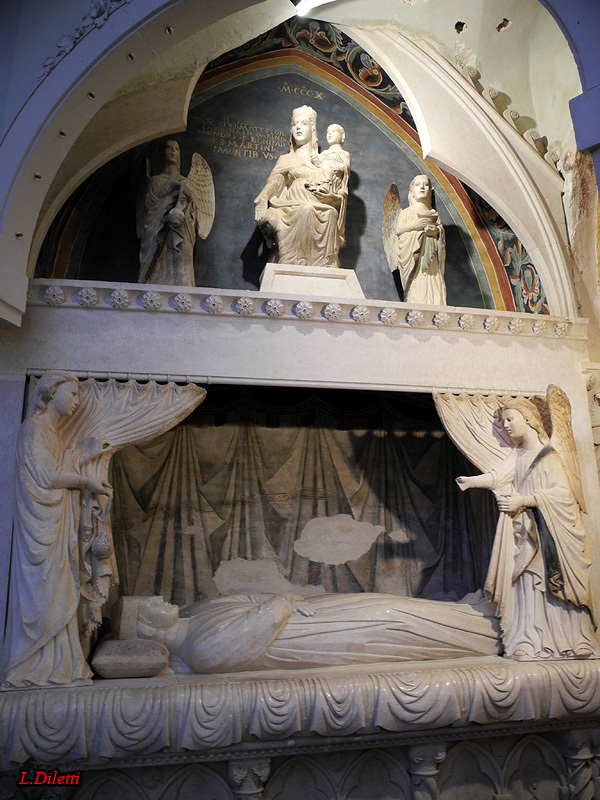 We then visited the Church of St Francis to see the great tomb of the parents of Gentile Partino with angels drawing back the curtains for us to view them with a Madonna and Child above. We were then taken up the tower for a surprise, and surprise it was, as it is not mentioned in any of the guidebooks. We came to the top of the stairs and were met with brightly painted naïve frescoed walls with the Life of Christ. Possibly early 15th century. Pure delight, with every single inch of the surfaces covered. From there we went to another charming hill town, Offida where we lunched and then walked along the burning hot streets to the Church of Santa Maria della Rocca with its 14th century frescoes. and the town boasts a pretty little 18th century theatre with paintings of the muses and its auditorium with a semi-circle of boxes. We returned to Ascoli Piceno. I found that William had not moved from his chair, apparently the cleaning ladies had worked around. He had not eaten anything and appeared quite content not to have done so. All very worrying. I went in search of some snacks for him and something to drink. While I was talking to him it slowly dawned on me that he did not know where he was. Clearly something was very wrong with him. He accompanied us to the Art Gallery, which sports a massive collection including works by Crivelli (almost completely ruined), Bellotto, Vigee Le Brun, Guercino, Maratta, Giordano, Guido Reni, etc. A feast. We were the only people in the gallery and as we went to each room followed by a team of museum guards, the lights were turned on for us and then off when we left. We had far too little time to look at things as it seemed to have very short opening hours. There was no catalogue, no postcards; the shelves in the museum shop completely bare and even the local book shops did not have a guidebook or postcards for sale. I doubt if there was a single foreign tourist in the whole town during our visit, hence, I suppose, the lack of anything. The main square sported an antique fair with the most appalling cheap tat for sale. The town also boasts an important Archaeological Museum. But the opening times made it impossible for us to visit. We dined independently with a small number of our group. Monday. The final full day of our tour. The moment we awoke, William announced he would not be coming but would stay behind. I hit the roof and I have to confess gave him a very hard time. He finally agreed to come, very reluctantly but at the end of the day thanked me for more or less forcing him to join the group on our final day as he enjoyed it so much. Our morning excursion was to the absolutely enchanting hill town of Monte San Martino (population 800 or so) with magnificent views of the snow-covered Apennines. We were just bowled over by the place. And sitting in this haven is the Church of San Martino with its magnificent altarpieces by Carlo and Vittore Crivelli. One can imagine the Crivelli brothers coming to stay at this remote place and being inspired to paint these quite beautiful jewel-like altarpieces in this tranquil setting; and to think that the town had somehow held onto them. 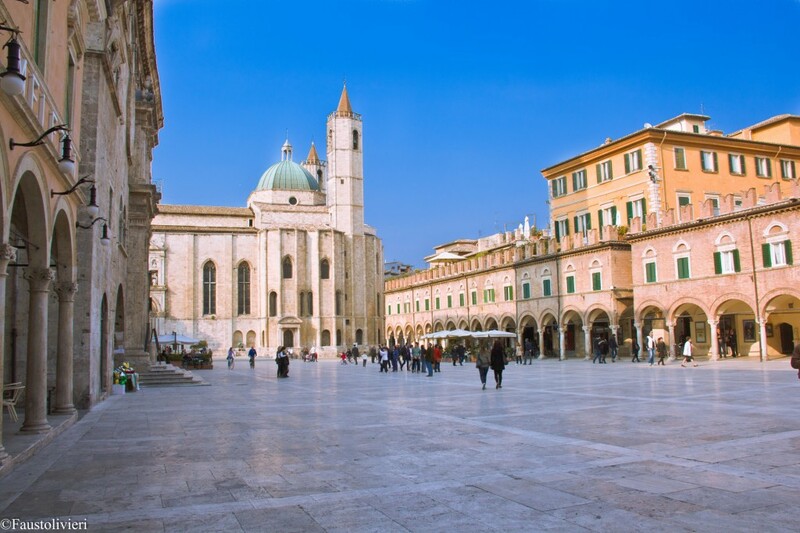 We returned to Ascoli Piceno where we had lunch with a small group from the party, and then visited with William still in tow, the Duomo which has a magnificent Carlo Crivelli altarpiece which is considered his masterpiece. What a way to end. That evening, we were taken as a group to dine at the Ristorante Gallo d’Oro after a mighty walk through the town. What a feast, and what incredible food. Course after course with salvers of small treats in-between straight from the oven. Quite unforgettable. We returned to the hotel to pack. Only a Martin Randall trip would find such a place. Tuesday. Our homeward journey took us right across Italy by coach from the east, Ascoli Piceno, to Rome in the west. The journey was enthralling as we headed towards the Appenines and then into a vast tunnel through the Appenines. The road leading from outside Rome to the airport was a nightmare of traffic jams with stops and starts. How we got to the airport in time for our flight is a mystery. But fortunately we flew Business Class and were pampered like mad. End of our travels. This turned out to be our last trip abroad. In fact it turned out to be our last trip away from Bridport. Never again would we travel to London or indeed anywhere else. Joanna and Guillaume. Derek’s niece Joanna and her husband Guillaume moved from Ashford and came to live in Bridport so that they could be near us if we were ever in need of help in the future. We little knew how quickly we would need their help when I was whisked out of the local medical centre by ambulance to Dorchester hospital with acute pancreatitis. Nil by mouth for six days, with tubes coming out of every place they coud find to insert or attach something. The irony is that pancreatitis is usually related to people with alcohol misuse, as I can’t stand the stuff it was a bit much that I should be the tiny percentage of people who are affected who do not have alcohol problems. I was under the impression that the hospital never really believed I did not have a drink problem and I in turn began to wonder if their diagnosis was correct. William became very disturbed during this period and but for Joanna and Derek’s sister Anne, who organised everything for him, we do not know what we would have done. Why did we not see that something was very wrong with him and his constant state of confusion and bewilderment needed attention. Anyway I was eventually discharged, none the worse for wear. Tragedy (ii). William’s memory loss and confusions were becoming worse which eventually led us to a consultant, who after many tests declared that William had quite advanced vascular dementia. We were devastated and went home to read as much as we could about it. The symptoms of dementia don’t get better, they just get worse and worse. And so it has proved. It meant that our travelling days were over and we would not even be able to go to London for a few days. Joanna and Anne. I managed to persuade Joanna to up sticks yet again and come to live nearer to us, two minutes away rather than ten minutes drive. So we found a nice house for her and then the purchaser pulled the plug a few days before contracts were due to be signed. No explanation, other than whim. The whole chain collapsed, everyone upset and in tears, everyone including Joanna was already packed and living among cases. The only financial viable way out of this was for us to sell part of our portfolio of stocks and shares and put up the money to buy the house and Joanna to put hers on the market again. It was sold in July 2016 and the money reinvested. My sister Anne and her husband Vic are also a huge support to us for which we are grateful. Cataracts and falls. William needed to have cataracts removed from both eyes, it was done privately and was a disaster. The outcome is that he is now almost blind in one eye. As though things weren’t bad enough, William fell down on the hard tiled kitchen floor one morning. We suspect it was another mild stroke. He had clearly hurt his spine. I will not detail the full tale of horror of trying to get him admitted to Dorchester Hospital through the A&E so here is a brief summary. Heaven help us all if Dorchester Hospital is like other hospitals in the country. When the ambulance delivered us to the A&E department of Dorchester hospital we were abandoned in a freezing defunct store room waiting to get him a bed, with William in agony. After many hours he was finally admitted. I left the hospital by taxi at midnight I got a call the following morning to say he had constipation and would I come and collect him. We had a nightmare journey back, every bump in the road agonizing for William. At home, still in agony, he refused to eat or drink, and had to be admitted to hospital to the dreaded A&E again the following day. Another long wait to get a bed. This time they bothered to x-ray him and discovered he had indeed fractured two bones in his spine a piece of information which was supressed and I only found out by accident. After a period in hospital he was sent home and delivered to the door by the ambulance people. William was shivering with a high temperature and clearly unwell. I was up all night with him. What could I do? The hospital apparently thought he was perfectly well which is presumably why they discharged him. Our doctor was called the following day. He immediately rang 999 and William was admitted yet again to the now feared A&E. Yet again we were left in corridors and spare rooms for hours on end till a bed was found, fortunately William completely unconscious throughout the wait and in fact one of the doctor’s thought he may be dying. After many days in hospital during which time the nursing staff had taught him to be incontinent. They gave him a bell to ring if he needed help or to go to the toilet, but William had no idea what a bell meant, so they put a catheter on him and cleaned up the bed each time it was messed. William is now incontinent. Something he had not been before going to hospital. I insisted that when they wanted to discharge him, which they clearly wanted to do as soon as possible, (does the hospital get points for discharging people quickly), he was to go to our local Bridport hospital to recover. It was like going from hell to heaven. The staff could not have been more caring. William eventually came home, early June, 2016 and now has a carer who comes each morning to wash and, shave and dress him and each week he attends a care centre for a day to try to stimulate him and I have time to do some shopping and take deep breaths. July 2016. William can no longer read, write or tell the time, his walking has been reduced to a supported shuffle and he is in a state of total confusion as to where he is and who I am. We occasionally get taken to West Bay with William in a wheelchair. He lost two stone whilst in hospital and I had to encourage him to eat when he returned home, but he soon recovered his appetite, enjoys his food and is gaining weight. For the rest we muddle along trying to do the best we can to make a reasonable life for ourselves against all the odds. An ending. When William’s dementia really took hold and he no longer recognised his home or anything in it, our collection of paintings and miniatures rather turned to dust. I sold almost everything and just kept a very few special things, mostly of sentimental value. One of them is of the Matterhorn. It is a slightly dreamy watercolour by an unknown artist of two young men standing on a wooden bridge over a stream looking up at the Matterhorn in the distance. William and I never did stand on a bridge looking up the Matterhorn, but I always visualise us as those two young men, excited and awed at seeing the Matterhorn, and it symbolises our lives, our wonderment and all our many travels around the world, of the many interesting people who have crossed our paths and the fact that we found each other all those many years ago. 22 November 2016. William and the family all went to a restaurant in Bridport to celebrate his 80th birthday. William very quiet and reserved, but he always enjoyed his food and just tucked in. PS. 2017. William was admitted to Dorchester hospital on Wednesday 19 April as he had suffered what they thought was a stroke and after some time they thought he might have also picked up some sort of chest infection. Instead of doing a brain scan they pumped him full of antibiotics. The hospital kept on hoping he would recover, and even had a physiotherapist come and access him. But, as the days went by William slowly deteriorated, each day worse than the day before, till eventually he was blind and unable to speak, hear or move, then unable to eat or drink. All of which happened in a very short time span. After 9 days they finally did a brain scan. William’s brain scan showed that one quarter was flooded with blood and the blood was pushing against the remainder of his brain which was all contorted. By now he was being kept alive solely on a drip. On the same day of the scan the doctors told me that William was dying, something I had already worked out all my myself, and there was nothing they could do for him. We agreed that the drip, which was the only thing keeping him alive, be turned off at 3pm. I had been by William’s bedside every day from the 19th, and now I watched him slowly dying of brain damage, starvation and dehydration. The only palliative care the law allowed William was to keep him clean and comfortable and free from pain, but by now he was incapable of making it known if he was in pain. He lay in bed, blind, deaf, unable to speak or move and unable to eat or drink. William put up a great fight to stay alive, I held his hand by his bedside most of the day and at the beginning his grip was extremely tight. Where did he find the strength? I asked how long it would be before William died and no one knew, though the palliative nurse said it sometimes took weeks before patients finally starved to death, the only hope was that the severe brain damage would put William out of his misery. What wicked laws we have. I asked that William be transferred to Bridport hospital but was informed that it would be impossible because of the impending Bank Holiday. During the Bank Holiday the doctors all disappeared, I asked who was on duty, and was told that there would be a doctor on call if needed. Brutal. On Tuesday, when all the staff returned, I insisted that William be moved to Bridport Hospital. At noon on the 4th May, William was transferred to Bridport Hospital; he was by now in a terrible state, he could not close eyes and tears just streamed down his face, also he could not close his mouth which was drying up. The staff said that they dare not sponge the inside of his mouth as a drop of liquid would mean he could choke to death. The hospital staff were absolute angels and William was given a room all to himself. By now he had ceased to recognise me, if indeed he had recognised me over the past few days. Instead of squeezing my hand, it now lay limp and lifeless in mine I grieved. I stayed with him till 8.30pm. I returned home in a state of utter emotional and physical exhaustion and now I am deeply regretful that I did so. I got a call from the hospital to say that William had died peacefully at 3.30 am. I managed to find a taxi in the early hours to take me to the hospital to say goodbye to William. How am I going to live without him? We’ve been together for 55 years and the last 16 days had been absolute hell. William has had to suffer so much since he was struck with dementia, but nothing, nothing could have prepared us for the horror of these last days. It was strange and heartening returning home through Bridport just as the dawn was breaking and feeling that William was now finally at peace. When William was first diagnosed with dementia, he and I discussed our funerals and accordingly I arranged the sort of simple funeral he decided on. My sister and niece and my aunt Joan (my mother’s sister) accompanied me and William to the crematorium at Weymouth on the 18 May, where at 12.15 pm we listened to Verdi’s Lament from Nabucco and Chrysanthemum by Puccini, both William’s choice. I gave my silent goodbye to William and then the curtains closed over the coffin. I now face life alone and am in despair.